A new research has found that breathing exercises may help obese women reduce their stress and blood glucose levels. The research developed by University of Massachusetts Medical School researcher Jon Kabatzinn revealed that Mindfulness Based Stress Reduction (MBSR) treatment has helped in reducing fasting glucose levels and to improve the quality of life in obese women. The practise involves paying attention to one’s thoughts and feelings and bodily sensations in the present moment in a non-judgmental and non-reactive manner through mindfulness exercises like breathing. The Assistant Professor of Medicine and Gynaecology at Penn State College of Medicine in the United States, Nazia Raja-Khan said MBSR reduces fasting glucose and improves quality of life considerably, without affecting body weight or insulin resistance. Generally, obese women are more prone to increased diabetes due to stress and end up with higher rate of cardiovascular diseases. In this particular study, women who received at least eight weeks of MBSR treatment reported reduced stress levels and it was noticed that their fasting glucose dipped considerably. Mindfulness breathing exercise simply focuses on being able to accept and be aware of your breath. However, on doing this perfectly, you are ultimately bound to receive the said benefits of stress reduction and reduced blood glucose levels. It has also been proven earlier that mindfulness breathing helps the mind focus better by boosting concentration levels and therefore, boosting productivity. Sit quietly in a chair with both feet on the ground and hands in your lap. Focus on your position, and bring your attention to the actual act of breathing. Just focus on the breath as it enters your body through nose and travels to your lungs. Notice the inward and outward breaths, and notice where the breath travels and departs. Focus on your breath when inhaling through your nose and notice your lungs relaxing. You don’t have to actually do anything, but just pay attention and be aware of it. It really does not matter if your breathing is slow or fast, deep or shallow. Allow your body to do the act naturally. You will also notice that each time you breathe in, your stomach will expand and when you exhale, your stomach will relax. Just be aware of these physical sensations when breathing. In case you are disturbed in between by some thoughts, just notice the thoughts, let them be, and again bring back your focus onto your breath. To start with, do this exercise for five minutes, and you can build up daily. This exercise can also be done lying down in bed if you have difficulty sleeping. It helps you to be more aware of your body and surroundings, and the body’s capacity to relax. When our breathing relaxes, our muscles relax too. 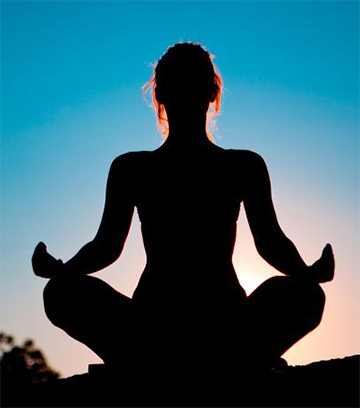 Did you know the link between yoga and dental hygiene?